Essential tremor is generally treated with medication or possibly surgery. Although alcohol may help reduce the tremor, it is not generally advised as a treatment due to its other effects. 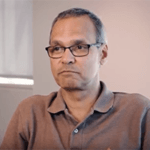 After years of managing his essential tremor and with worsening symptoms, Clinton decided to try deep brain stimulation (DBS) with Dr Rodrigues.